Houston – The leadership at the Greater Houston Partnership today expressed its enthusiasm over the passage of a Congressional funding bill for NASA. If signed by President Barack Obama, the bill could impact the Houston region by potentially preserving thousands of jobs that appeared to be lost. The spending bill enjoyed bipartisan support in the Senate, with that legislative body unanimously approving it this past August. Through some 11th-hour efforts, the House was able to pass and reconcile its own version of the bill last night before Congress convened for the fall election cycle this Friday. Moseley thanked the local congressional delegation for their continued efforts ensuring the passage of the legislation. Late Wednesday, the House of Representatives passed legislation negotiated by Senator Kay Bailey Hutchison (R-Texas) securing NASA’s $19 Billion 2011 fiscal budget. It is designed to safeguard America’s human spaceflight capabilities, according to supporters, while balancing commercial space investment with a robust mission for NASA. The bill now lands on President Barack Obama’s desk for his signature. “Six months ago we were faced with an Administration proposal that would have ended the era of U.S. dominance in space exploration, threatened our utilization of and investment in the International Space Station, and jeopardized America’s leadership in manned space flight. “This bill provides needed direction to NASA that will preserve many of the jobs and critical skills the agency would continue to lose amid budgetary uncertainty. Preserving these skills and applying them directly to the new launch capability and other programs will allow our nation to continue to be the global leader in space,” Sen. Hutchison added. The bill would extend full utilization of the ISS through at least 2020 and promote safe and effective operation, maintenance, and maximum utilization of the space station by ensuring that replacement or spare parts are available for delivery and installation to assure sustained operations. The bill also reserves research space for private entities to encourage a broader range of scientific research. The bill would authorize and direct NASA to fly the space shuttle Launch on Need (LON) flight pending results of a required assessment of safe means of return for astronauts if the shuttle is damaged or unable to return. The bill also would preserve space shuttle capabilities through 2011 to complete the current manifest of scheduled flights. The bill would direct NASA to continue the Commercial Orbital Transportation Services Program (COTS) in support of providing cargo services to the ISS and would establish requirements for the definition of milestones and minimum performance objectives to be achieved before procurement authority is granted for commercially developed crew transportation capability. The bill would direct NASA to initiate development of a government-owned, NASA-designed and operated “Space Launch System” (SLS) – a heavy lift launch capability – as soon as practicable and would establish the end of 2016 as the goal for initial capability to deliver crew and cargo to the ISS. To facilitate that schedule, the bill allows modification and/or extension of existing contracts. The bill would require NASA to develop a multi-purpose crew transportation vehicle based on Orion for use with the Space Launch System. The bill would require a study to identify an approach for the most efficient use and maintenance of NASA facilities and infrastructure, paying specific attention to eliminating unneeded duplication of infrastructure. It would also prohibit NASA from making any movement or termination of contractors or civil servants or any reorganization or Reduction in Force for reasons other than cause, until Congress receives the required reports and grants legislative authority to make such changes. Several members of Houston city council stood in solidarity on the steps of city hall Wednesday morning to say they could not support Prop. 1, the plan to collect a monthly fee to fix the city’s flooding and drainage problems. Council members Wanda Adams, Jolanda “Jo” Jones, C.O. “Brad” Bradford and Jarvis Johnson say they have critical concerns which must be addressed in an implementation ordinance. “As public officials, we have a responsibility to let our constituents know what they are voting on. To date, we cannot answer those questions because the information has not been provided,” said Adams. Mayor Annise Parker is expected to outline the potential implementation of Proposition No. 1 at this mornings city council meeting. Why Are Houston Firefighters Endorsing Perry Over White? Governor Rick Perry will travel to Houston on Wednesday to pick up a big endorsement from the Houston Professional Fire Fighters Association – Local 341. President Jeff Caynon confirmed that his group will back Perry over former Houston Mayor Bill White in the race for Governor of Texas. “Governor Perry has consistently supported fire fighter’s causes,” said Caynon in response to my text message asking why the 3,800 member association is supporting Perry. At this point I think it’s worth noting that many groups that endorse in political races have a “friendly incumbent” rule. That means the group will endorse an incumbent who shares the basic philosophy and supports its causes, even if the opponent also supports the group’s issues. How will this endorsement play in the larger context of a statewide campaign? I’m sure folks in East and West Texas will wonder why Houston firefighters chose Governor Perry over the city’s former mayor. As long as the union doesn’t slam White’s record on public safety , White can minimize the damage. However, Perry’s campaign would be smart to tout the endorsement from the country’s fourth largest firefighter’s union located in his opponent’s hometown. I’m posting this election story from the Washington Post, which like KPRC Channel 2, is owned by the Washington Post Company. It’s about the Democratic Governor’s Association’s decision to spend money targeting Governor Rick Perry’s bid for relection against democrat Bill White. Perry’s campaign has also responded to the article, and I’ve posted the statement after the article. In a surprise move, the Democratic Governors Association has decided to up the ante in Texas, with plans to launch an attack ad against Gov. 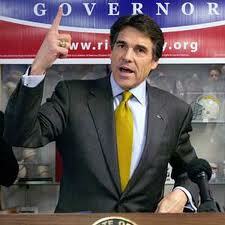 Rick Perry (R ) that assails him as a career politician who has lost touch with the people of the Lone Star State. The audacious action comes in a state that has been a Republican stronghold for more than a decade. But Democrats have concluded that, even in a year that tilts strongly toward Republicans, Perry is more vulnerable than he has appeared in his race against Democrat Bill White, the former mayor of Houston. The DGA has already contributed $2 million to White’s campaign. The new ad buy, which is scheduled to begin running in the Dallas area Tuesday, represents an independent expenditure on behalf of White. A Democratic strategist said the DGA would spend about $650,000 to $700,000 a week on its ad campaign. The latest poll in Texas, conducted by Blum & Weprin Associates for a consortium of Texas newspapers, gave Perry a seven-percentage-point lead, 46 percent to 39 percent. The poll was published on Sunday. Perry’s lead was consistent with other surveys taken in September. The public poll showed White and Perry running about even in the Houston area, where White is well known. But Perry held a solid lead in the Dallas area. The DGA hopes its ad campaign will cut into that margin there, which could be the key to White’s hopes of winning. Perry became governor in December 2000 after then-governor George W. Bush resigned to become president. He has been reelected twice to four-year terms and is now the longest-serving governor in the state’s history. In a year in which incumbents of both parties have found themselves on the defensive, Democrats hope to turn Perry’s long tenure against him. The ad concludes by saying, “Twenty-five years as a politician has changed Rick Perry alright – for the worse.” A copy of the ad was made available to the Post before it went on the air. The ad attacks Perry on several fronts. Among them are ordering 11- and 12-year-old girls to be vaccinated against a virus that causes cervical cancer and proposing a mammoth Trans-Texas highway corridor that would have taken land from many private property owners. Both proposals eventually were blocked, but Republicans and Democrats have continued to criticize Perry for his actions. Texas Sen. Kay Bailey Hutchison (R ) included both in her primary challenge to Perry last spring but fell far short in her bid to unseat him. Democrats face substantial losses in governors’ races this fall, with Republicans looking to finish the elections with at least 30 of the 50 governor’s mansions. But Democrats are running competitively in three of the nation’s most populous states, all of which elected Republicans governors four years ago. In California, Democratic attorney general and former governor Edmund G. “Jerry” Brown Jr. holds a narrow lead over Republican Meg Whitman, the former CEO of eBay. In Florida, Democrat Alex Sink, the state comptroller, is running even with businessman Rick Scott, who was the upset winner or the GOP primary in August. An upset in Texas could provide an improbable sweep of the big Sunbelt states, although defeating Perry is seen as the most difficult of the three. Democratic officials believe it is worth an additional investment in White’s candidacy to see how vulnerable the incumbent may be. With Gov. Perry holding a commanding 30-point lead over Bill White in the Dallas-Fort Worth region, according to a recent newspaper poll, President Barack Obama and his Washington Democrat attack machine are hoping to bail out Bill White’s failing campaign by funding negative attack ads in the Dallas-Fort Worth region. If you have listened recently to local radio you have probably heard a political ad paid for by John Faulk, the republican candidate for the 18th Congressional District. 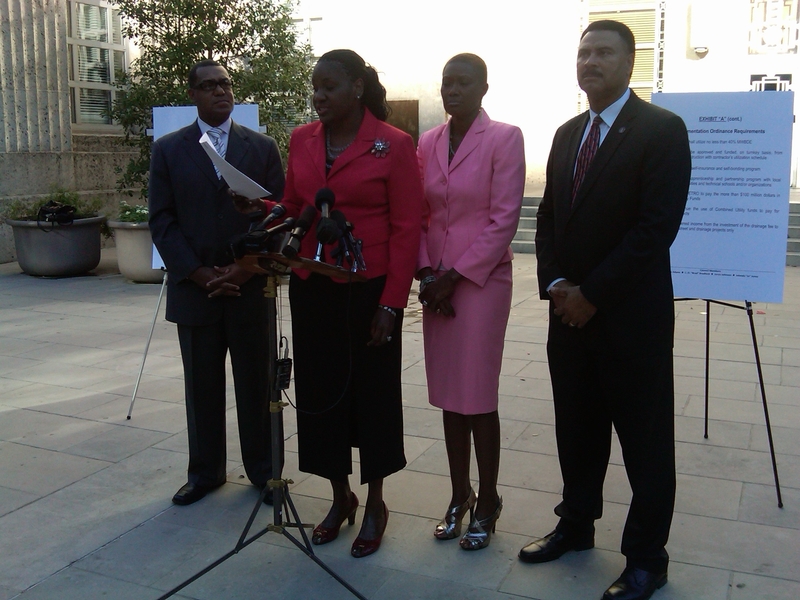 Faulk is trying to link incumbent democratic Congresswoman Sheila Jackson Lee to a scandal plaguing the Congressional Black Congress. U.S. Rep. Bernice Johnson of Dallas has admitted that she awarded college scholarships worth thousands of dollars to family members and family members of friends. There is no evidence that Congresswoman Jackson Lee has done anything wrong. However, in the radio spot you hear a woman’s voice raising doubt about SJL’s record and questioning if she has any connection to the controversy. (Houston, TX)…..As the upcoming November 2nd General Election approaches, it appears to be business as usual for Republican candidate John Faulk who is attempting to smear the incumbent representative of the 18th Congressional District, Congresswoman Sheila Jackson Lee, with his latest advertising tactic. Faulk, a candidate with no record, is using “lies and misrepresentation” to smear his opponent who continues to run on her record of service and ability to bring millions of dollars back to the constituents within her district. Faulk’s latest radio ad, which has a racist undertone and is attempting to confuse and mislead the voters with a commercial with an African American female voice, refers to the alleged actions of another congressional representative and attempts to smear Jackson Lee and question her credibility. This unfortunately is the usual “low down, dirty political tactics” of many Republicans. The voters are astute enough to see beyond this type of negative campaigning. Jackson Lee has continually represented and brought resources back to Texas and the 18th Congressional District for 15 years including: she has brought $6 billion in stimulus money and 269,000 jobs to Houston and Texas as a part of the American Recovery & Reinvestment Act; she has brought $1.7 billion for improvement of school and schools and colleges; she has brought $374.5 million for transit improvements; she has brought $120.4 million for public housing projects; she has brought $147.2 million to enhance public safety within our communities; she has brought 1 million dollars to Riverside General Hospital for its TRICARE Participant designation to treat military personnel for Post-Traumatic Stress Disorders; $15 million to the Houston Ship Channel; $300,000 to the Texas Southern University’s Mickey Leland Center for archival preservation; $1 million for Harris County Flood Control District; $500,000 for a minority cancer control program at the University of Texas; $200,000 for both the City of Houston and FEMA Pre-Disaster Mitigation along with funding for many other worthwhile projects. Jackson Lee, a lifelong Democrat, has a committed and demonstrated track record of service to her district, community and nation. Republican John Faulk has no record within the district and as a result is attempting to use smear tactics instead of focusing on the issues that affect the constituents of the district. What is Faulk planning to do for the constituents in addressing the issues of the 18th Congressional District is the real question? Somehow I missed the bus. This past Saturday, I tried to get the Harris County Republican Party Headquarters on Richmond Avenue to take a few pictures of RNC Chair Michael Steele as he rolled into town on the “Fire Nancy Pelosi” bus tour. I arrived just in time to see the bus leaving town. I did notice there was a small enthusiastic crowd snapping pictures of the bus, and I assume pictures of Steele, before it departed for the next scheduled stop. The bus tour didn’t get much local media coverage. Someone did send me a link to a report filed by local republican blogger, Big Jolly. He writes about an encounter he had with on-site security. He says they threatened him for standing on the sidewalk while waiting to take pictures. No one else at the event is described by color or size. 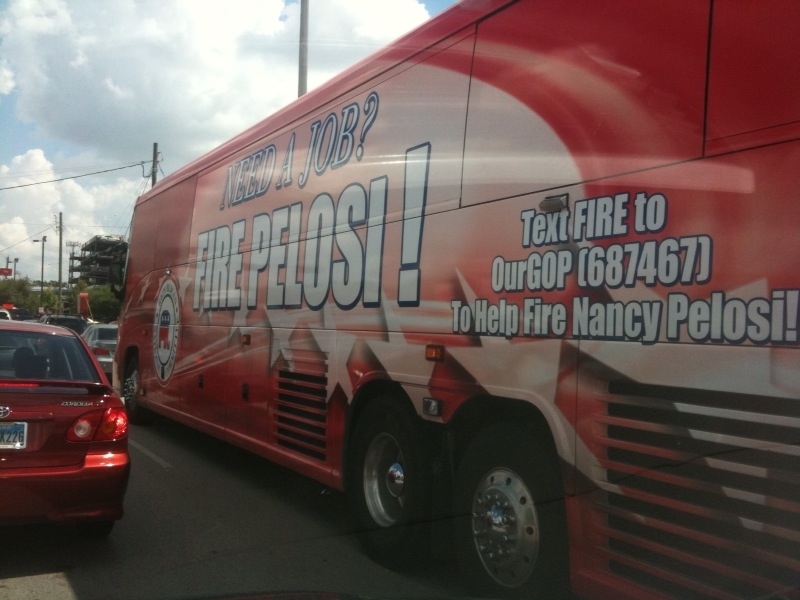 Anyway, as I reported in the announcement about Steele’s plans to visit Houston, the “Fire Pelosi” bus tour is making its way cross-country. The message to republicans and tea party members is – go vote in the midterm elections and help the party regain control of the U.S. Congress. With early voting scheduled to begin in a few weeks some local democrats say they are optimistic about turning Harris County blue this election year. 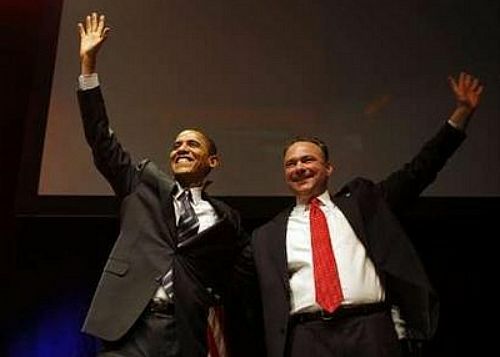 While the D’s made some gains in 2008 thanks to Barack Obama’s successful presidential campaign, opinions are divided over whether the party can sweep the countywide seats up for grabs in 2010. That’s where former Virginia Governor and DNC Chair Tim Kaine steps in. Kaine is flying in on Friday, October 8th, to headline the party’s annual Johnson-Rayburn-Richards dinner. No doubt Kaine’s presence in Harris County will help pump up the party faithful and energize those who are not as enthusiastic about voting on election day. News Anchor Barbie Reporting Live From The Scene…..
We’ve all heard the jokes about TV stations hiring anchors who resemble “Ken and Barbie” dolls to read the news. Thanks to toy company Mattel for finally designing a real “News Anchor Barbie” doll. the news media are anxiously awaiting her debut. Barbie has been an astronaut, doctor and engineer. Why shouldn’t she be a news anchor? camera and a pink reporter’s notepad. With less than 40 days until the election and the final day of the latest campaign reporting period, most political candidates were scrambling to raise cash by the Thursday, September 23, midnight deadline. That included democrat and judicial candidate Brandon Dudley, who is running for Judge of the 182nd Criminal District Court against the incumbent republican, Judge Jeannine Barr. 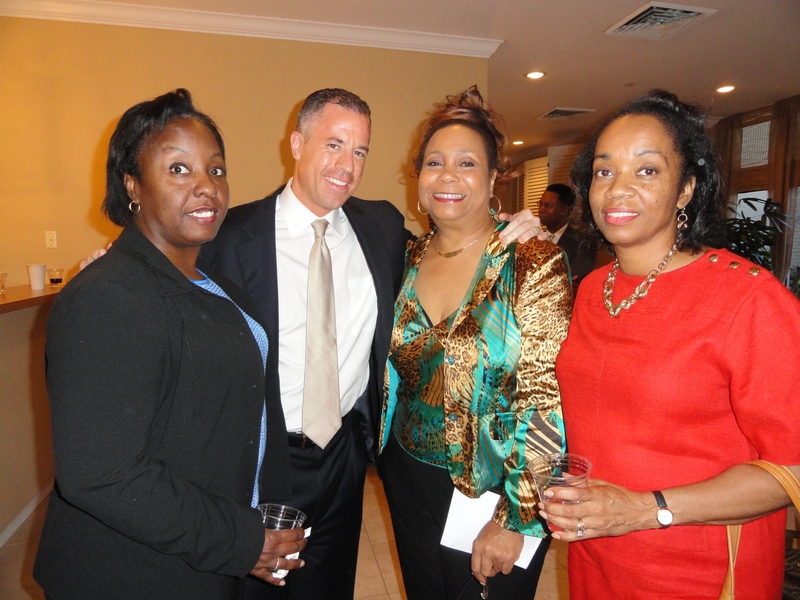 Dudley was feted at a fundraiser hosted by several prominent women political and community leaders. The Honorable Sissy Farenthold. NAACP President Carolyn Scantebury and many others opened their pocketbooks and promised to campaign for his election.